Denver, CO & New York (February 23, 2017) – “Disney’s Newsies: The Broadway Musical!” three-day cinema event broke ticketing records to become the highest-grossing Broadway event to date from Fathom Events. An estimated 210,250 people saw the event on big screens across the U.S. on February 16, 18 and 22, amounting to $3.47 million in ticket sales. It also now ranks as the No. 2 top-performing title for Fathom Events to-date. Due to this overwhelming fan demand,“Disney’s Newsies: The Broadway Musical!” returns to big screens across the country for an encore screening on Saturday, March 4 at 12:55 p.m. local time. Tickets and participating theater locations for this encore showing will be available soon at www.FathomEvents.com. Captured live on stage, the event features Jeremy Jordan, reprising the Tony nominated role he created as “Jack Kelly.” Fathom Events partnered with Disney Theatrical Productions to bring this spectacular stage show to the big screen, including special behind-the-scenes footage and interviews with the cast and creators. Jordan is joined by original Broadway cast members Kara Lindsay as Katherine, Ben Fankhauser as Davey and Andrew Keenan-Bolger as Crutchie, and “Newsies” North American Tour stars Steve Blanchard as Joseph Pulitzer, Aisha de Haas as Medda Larkin, and Ethan Steiner as Les. 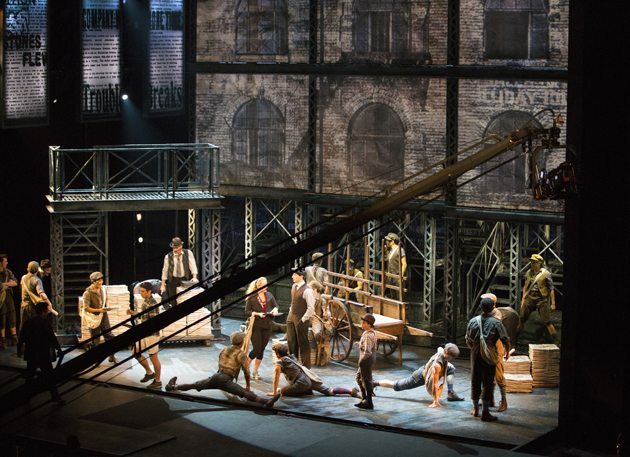 Since opening on Broadway in 2011, “Newsies” has played 1,711 performances between Broadway and the North American tour, to more than 2.5 million audience members in 65 cities across the country, concluding its run at the Hollywood Pantages Theatre last fall where it was captured live on stage for this cinema event. Fathom Events is recognized as the leading domestic distributor of event cinema with participating affiliate theaters in all 100 of the top Designated Market Areas, and ranks as one of the largest overall distributors of content to movie theaters. Owned by AMC Entertainment Inc. (NYSE: AMC), Cinemark Holdings, Inc. (NYSE: CNK) and Regal Entertainment Group (NYSE: RGC) (known collectively as AC JV, LLC), Fathom Events offers a variety of one-of-a-kind entertainment events such as live, high-definition performances of the Metropolitan Opera, dance and theatre productions like the Bolshoi Ballet and National Theatre Live, sporting events like Copa America Centenario, concerts with artists like Michael Bublé, Rush and Mötley Crüe, the yearlong TCM Big Screen Classics film series and inspirational events such as “To Joey With Love” and Kirk Cameron’s Revive US. Fathom Events takes audiences behind the scenes and offers unique extras including audience Q&As, backstage footage and interviews with cast and crew, creating the ultimate VIP experience. Fathom Events’ live digital broadcast network (“DBN”) is the largest cinema broadcast network in North America, bringing live and pre-recorded events to 896 locations and 1,383 screens in 181 DMAs. For more information, visit www.fathomevents.com. Disney Theatrical Productions operates under the direction of Thomas Schumacher and is among the world’s most successful commercial theatre enterprises, bringing live entertainment events to a global annual audience of more than 19 million people in more than 50 countries. Under the Disney Theatrical Productions banner, the group produces and licenses Broadway musicals around the world, including “Beauty and the Beast”,” The Lion King”, Elton John & Tim Rice’s “Aida”, “Tarzan”, “Mary Poppins”, a co-production with Cameron Mackintosh, “The Little Mermaid”, “Peter and the Starcatcher”, “Newsies”, and “Aladdin”. “Frozen”, based on the Academy Award-winning film, is slated to open on Broadway in 2018. Other successful stage musical ventures have included the Olivier-nominated London hit “Shakespeare in Love”, stage productions of Disney’s “High School Musical”, “Der Glöckner Von Notre Dame” in Berlin, and “King David” in concert. DTP has collaborated with the country’s leading regional theatres to develop new stage titles including “The Jungle Book” and “The Hunchback of Notre Dame”.